"Poor athletic performance may be related to vitamin deficiency. Researchers from Oregon State University reviewed 98 studies on the B vitamins and their roles in energy metabolism and cell regeneration. They determined that if you're active and your system lacks B vitamins, you decrease your ability to perform high-intensity exercise, as well as your ability to repair and build muscle. If you don't get enough B vitamins in your diet through dark green leafy vegetables, lean meats, and nuts, consider taking a multivitamin or a B complex that contains 400 mcg of folic acid, 1.3 mg of vitamin B6, and 2.4 mcg of vitamin B12, plus thiamin and riboflavin." Interestingly, I recently wrote how you can get all of your folic acid needs through a single bowl of breakfast cereal; in fact those cereals typically have the bulk of all your B vitamin needs as well. So it seems now that this morning snack also can help with muscle repair and athletics in addition to making you look cool. 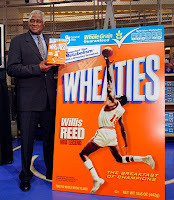 :) It seems your Wheaties do have something going for them after all. Of course, if your not a cereal eater then a vitamin supplement is always a viable option.